I have the latest version of the firmware on the phone. When i power it up, it boots up, gets to the menu screen, then reboots right away. I have checked and re-attached the GSM module with no luck. Any ideas? That kind of gibberish is usually a sign of a baud rate mismatch. The computer is listening at a different rate to the rate that the ArduPhone is outputting data. Try changing the baud rate in the serial monitor from 9600 to 38400. 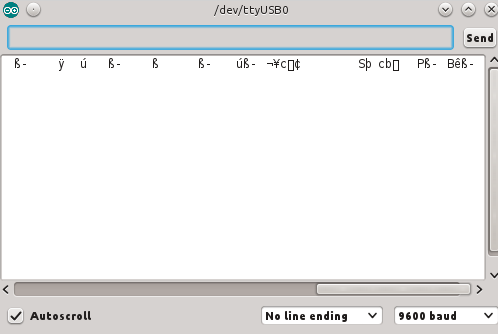 The "usbserial.ino" part of the sketch has the call to Serial.begin() that sets the baud rate to 38400. Some recent Arduino IDEs (1.5.x I think) don't have 38400 as an option any more, in which case the easiest thing to do is to change the value in usbserial.ino to Serial.begin(9600) or 19200.